Larry Neu, quartermaster of Veterans of Foreign Wars Post 4265, turns in disgust Tuesday night during a discussion with Craig City Council members about reopening lease negotiations for Veterans Memorial Park. The future of Veterans Memorial Park, once known as Craig City Park, was again a discussion item during Tuesday’s Craig City Council meeting. Guy Bradshaw, commander-elect of Veterans of Foreign Wars Post 4265, was joined by more than a dozen local veterans in his pitch to resuscitate lease negotiations between the VFW and the city. Bradshaw cited the outcome of the April 10 council meeting in which council members voted to discontinue lease negotiations with the VFW by a 5-0 vote. Council member Jennifer Riley was absent from the April 10 meeting and did not vote. 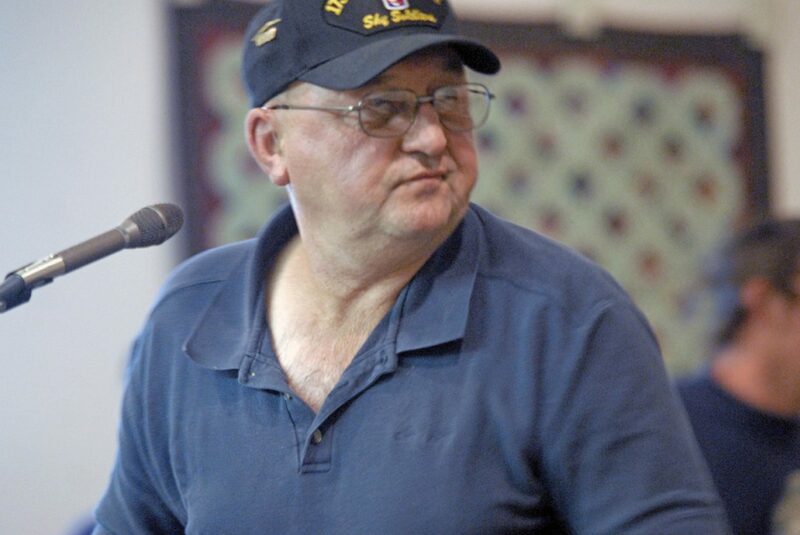 Mayor Terry Carwile abstained from voting given his lifetime membership with the local VFW. City council members cited the length of time already invested in the negotiation process and a perception the VFW had lost interest in their decisions April 10. On Tuesday, Bradshaw said his organization hasn’t lost interest. He said the VFW membership wanted to continue talking if the city was willing to address two points of contention with the original draft lease written in January. Bradshaw said VFW members did not like the idea of a utility reimbursement and would prefer a shorter lease term. Council member Byron Willems highlighted the city’s pledge to install new bathrooms in his rebuttal against a short-term lease. “At budget time we had plans to allocate funds for new bathrooms at the park and we wanted to do those this year, but we didn’t have a lease, so we didn’t dare appropriate any funds for the park,” Willems said. “I can see where you are coming from about none of us are going to be here in 25 years, but bathrooms are going to cost about $70,000 a piece. In addition to the issue of tying park improvements to an agreeable lease term, the consensus among council members was that too much time had already been invested in the negotiation process with no results. Carwile interjected to remind the council, VFW members, and the public that council members had already taken official action to end lease negotiations. According to parliamentary procedure, someone from the prevailing side of the issue would need to offer a motion to reconsider for Tuesday’s discussion to continue. Considering Riley and Carwile did not vote April 10, and one of the prevailing members, Don Jones, was absent from Tuesday’s meeting, Carwile told Bradshaw asking council to reconsider might be a risky move. “Since there are only four members eligible to vote on a motion to reconsider, if there is a 2-2 tie, the motion would fail and we wouldn’t continue negotiations,” Carwile said. Bradshaw asked for a moment to confer with his members. The discussion later resumed. Bradshaw said there were three items the VFW wanted answered. The first was in reference to bathrooms. “During Craig clean-up last year, the city employees did not have access to restrooms over there and came down to use our restrooms,” VFW Quartermaster Larry Neu said. “I’m saying they’re not maintained to be used. Bradshaw returned to the podium and stated the next membership meeting would take place May 21. He asked that the VFW be allowed to mull over the issue until shortly after Memorial Day. In the meantime, Bradshaw asked council to present the VFW with a lease it believed was reasonable for the VFW membership to consider. “Isn’t that what we did back in January?” Riley said. Neu once again took the podium. Carwile again interjected, saying the direction of the conversation was steering toward lease negotiations. He asked council members to offer a motion to reconsider before discussions could proceed. But council members were hesitant to reopen negotiations because of Jones’ absence. Neu and about half of the VFW members in attendance left the meeting. With no motion on the floor, Carwile asked Craig City Attorney Kenny Wohl to explain the eminent domain process to the audience and for the record. He then asked Parks and Recreation Director Dave Pike what would need to be done to remove the city’s equipment from the VFW’s property. During a closing statement, council member Joe Bird reached out to the remaining VFW members in attendance. Bradshaw replied that it wasn’t. “On our part, we’re still going to discuss it,” Bradshaw said. “That is not the consensus of the group. We are a pretty patriotic group, but the people that are still here want to continue to keep talking. Bird said he would be open to hearing the VFW’s proposal after Memorial Day, but only if a timeline is attached. At such time, Wohl added, the council could render a motion to reconsider lease negotiations.